In a historic ruling handed down by the Kuala Lumpur (KL) War Crimes Tribunal in Malaysia last week, former-US President George W. Bush was found guilty of war crimes along with his associates, Richard Cheney, former U.S. Vice President, Donald Rumsfeld, former Defense Secretary, Alberto Gonzales, then Counsel to President Bush, David Addington, then General Counsel to the Vice-President, William Haynes II, then General Counsel to Secretary of Defense, Jay Bybee, then Assistant Attorney General, and John Choon Yoo, former Deputy Assistant Attorney-General. Image: A scene from the Kuala Lampur War Crimes Tribunal, Malaysia. If the global elite can contrive the International Criminal Court to provide cover for real crimes against humanity, why can’t the people of the world create courts to convict them? Unlike the ICC which depends on military power to enforce its rulings, courts of the people, when convicting the global elite, can simply boycott the corporations and institutions involved, starving them of both legitimacy and resources. While it falls short of deserved jail sentences, the reality of the current global balance of power makes “jail sentences” unrealistic until actions like sanctions and boycotts equalize that balance. 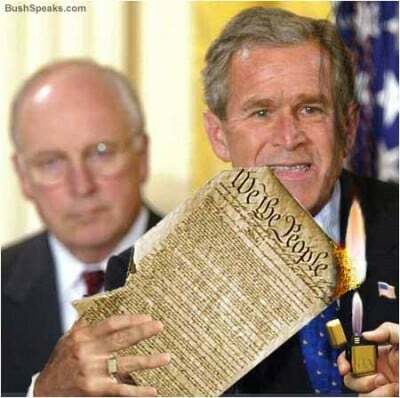 According to a report from Mathaba.net, Bush and his associates were found guilty as charged and convicted as war criminals for “Torture and Cruel, Inhumane and Degrading Treatment of the Complainant War Crime Victims.” The article would go on to enumerate the charges, the definitions used to define the criminal acts the accused parties were tried for, and the legal precedence used, set by the Nuremberg trials after World War II. While critics claim the KL War Crimes Tribunal holds no legitimacy, readers should be reminded that the International Criminal Court (ICC) itself is contrived by corporate-financier interests, for corporate-financier interests. And all courts worldwide, in a truly free and “democratic” society, should be of, for, and by the people. The tribunal held in Malaysia this month in fact represents a much wider spectrum of interests and individuals than even the ICC. And in a world where corporate-financier oligarchs enjoy exercising the “might makes right” doctrine, that the KL War Crimes Tribunal has been able to hold a professional hearing, well attended, covered globally by independent media outlets, and able to get its historic ruling read by millions, in and of itself makes it “legitimate” by the global elite’s own standards. While the KL War Crimes Tribunal lacks any practical means to bring to justice the convicted, in terms of a judicial sentence, the ICC itself has had only a handful of cases itself. But unlike the ICC, which is represented by a top-down hierarchy of corporations and financial institutions dependent entirely on the masses patronage to perpetuate themselves, their power, and the legitimacy of their institutions, the KL War Crimes Tribunal represents a bottom-up paradigm which can easily impose crippling sanctions on the corporations, institutions, and organizations that helped author the policies executed by Bush and his associates. A partial list of these interests can be found here, and it is highly recommended that people incensed by the continued criminal behavior of Wall Street and London, and all of the corporate, financial, and governmental entities that gravitate around them, begin organizing themselves and their efforts to promote boycotts as well as find or create viable alternatives. Just as activists, genuine human rights advocates, and independent media organized themselves to deal Bush and his associates a well deserved conviction, we can similarly begin imposing well deserved penalties – the undermining, elimination, and replacement of the corporations, financial institutions, and organizations that facilitate their crimes.